Joseph Smith. Courtesy: Intellectual Reserve, Inc. Founder of a uniquely American religion, Joseph Smith was a poor farm boy who became a charismatic prophet, much criticized polygamist, town and temple builder, and finally a martyr for the faith he had established. Joseph Smith was born in Vermont in 1805. His parents possessed considerable learning but limited means to secure a livelihood. As a boy, Joseph made strong impressions on those around him, especially after the family moved to western New York. His mother would recall the courage he showed as a seven-year-old during a painful operation to save his leg following the ravages of typhus fever. In 1825, when Smith was barely 20, a 21-year-old teacher named Emma Hale was quite taken by him when he boarded at her father's house while treasure-hunting nearby; so taken, in fact, that she married him in January 1827. But Smith produced strong negative feelings as well. Hale's father, who disapproved of their marriage, called him "careless" and "insolent." Nor did the treasure-hunting, often performed with the help of divination devices called seer stones, sit well with everyone; in March 1826 Smith's activities led to a criminal complaint, forcing him to swear off the practice. As Smith would tell the story, of all those who took notice of young Joseph, none proved more pivotal than the Almighty. Beginning in 1820 at age 14, Smith received a series of visions that would shape his future. In the first of these he saw a pillar of light and images of God and Jesus Christ. During this vision, he was warned that all Christian denominations had strayed from the truth. Then, beginning in 1823, he had a series of visions in which an angel named Moroni told him about a book written on gold plates. The book imparted the history of a group of Israelites who settled in the Americas around 600 B.C. After an extended period of testing, Smith was allowed to retrieve these plates along with a device that permitted him to read the writing on them. Between 1827 and 1830, Joseph translated these writings by dictating what he said he read, first to his wife Emma and then to others. He called the resulting work The Book of Mormon. The young prophet and a small group of followers who gathered around him believed that the book that came into existence in this miraculous way was a new work of scripture. When they founded a church, they called it "the Church of Jesus Christ," but outsiders named it after the mysterious new scripture, calling it the "Mormon Church." Although its members called themselves Christians, outsiders referred to them as "Mormonites." To escape ridicule and treatment that they regarded as persecution, the small Mormon flock left western New York and, in 1831, began a series of westward migrations. As new converts joined the group, they were called to "gather" with the prophet and his co-religionists who by this time called themselves Latter-day Saints. Together the group headed to Kirtland, Ohio, where they would settle for the next six years. Not long after arriving, however, the prophet sent a substantial number of his followers to Independence, Missouri. The Kirtland period brought out the essential aspects of Smith's personality. A physically attractive man, he was charismatic and dynamic -- he managed to organize the building of a temple 110 feet high using only the resources of an impoverished group of settlers. During this period Joseph announced and his followers rapturously received some 65 revelations; during the temple's 1836 dedication, some witnesses even said they saw God standing next to him. But the prophet, as he became known, also had a down-to-earth side. Upon first arriving in town, he walked up to the local storekeeper, shook hands, introduced himself, and said, "You've prayed me here, now what do you want of me?" It turned out there was much for him to do. Smith's reach continued to expand as the Mormon Church grew. As ever-increasing numbers of the prophet's followers settled in the region and as their influence spread, the earlier settlers to the area became alarmed that they would be overwhelmed by these people who called themselves Latter-day Saints. They became so threatened that they drove them out of the area. The Saints became refugees, going first to Clay County, Missouri, and then to a new county on the state's western boundary. Non-Mormons found much to discuss and dislike about the Mormons. Smith, himself, was rumored to have taken another wife in the mid-1830s, but this rumor was far less important than the fact that he and some of his followers founded a bank in 1836 that failed during the Panic of 1837. He left Kirtland, Ohio just a few steps ahead of angry creditors in January 1838, and fled to Missouri to join the Saints who had started to build a thriving settlement in a town they called Far West. But the reception in Missouri was even more troublesome than it had been in Kirtland. Violent mobs and a hostile government led to the prophet's arrest and drove the Mormons from that state within a year. A man with less determination might have given up, but Smith only broadened his vision. Buying 15,000 swampy acres on the Mississippi in Illinois, he built a city that soon rivaled the young hub of Chicago. Thousands of Mormons flocked to this new settlement, called Nauvoo. Smith quickly consolidated his power there. He ran the city, the courts and the Nauvoo militia, which grew to become the state's biggest military entity. Depicted in grand uniform in his only portrait from life, Smith began to strike many as a kind of religious despot, a threat to American freedom rather than an expression of it. Criticism increased when rumors of polygamy spread both within and outside the community. Actually, the prophet (who was busy marrying many plural wives) dictated a revelation about "celestial marriage" that included an endorsement of polygamy in 1843. 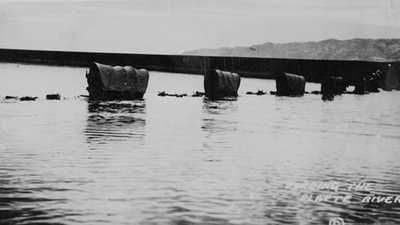 But this revelation did not become public until 1852, five years after the Latter-day Saints reached the Great Salt Lake Valley. In the meantime, this practice caused enormous confusion and considerable negative reaction within the Mormon community. When some of Smith's followers published a newspaper the next year that made public complaints about the way the city was being run and about plural marriage, Smith ordered the destruction of this newspaper. Threatened with arrest and potential death at the hands of his enemies, Smith began to flee Nauvoo, then turned back and accepted his fate. He was shot to death by a mob on June 27, 1844. In the wake of the prophet's death, members of the Smith family vied for power with members of the church's leadership bodies, especially the members of the "First Presidency" and members of the Council of the Twelve. As a result, the church fragmented. Some Mormons realized that by living together in a single place -- by being a "gathered" community -- their movement was generating opposition. 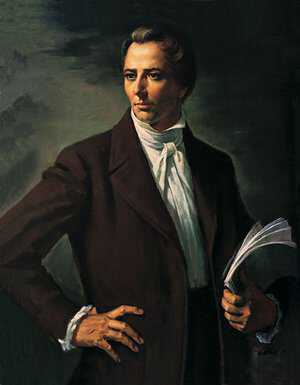 Others, many of whom had not lived in Nauvoo between 1839 and 1844, were convinced that while The Book of Mormon was truly a new scripture, "a new testament of Jesus Christ," that in Nauvoo Joseph Smith's prophetic powers had been turned to fraudulent uses -- especially with regard to sexual practices. Rejecting polygamy, some of these Saints remained in the Midwest while others went in other directions -- to Michigan's Upper Peninsula (the "Strangites"), to Pennsylvania (followers of Sidney Rigdon), to Texas (the "Wightites"), and elsewhere. The largest group of Smith's followers went west with Brigham Young, but a substantial minority stayed in Illinois, Iowa, and Missouri. 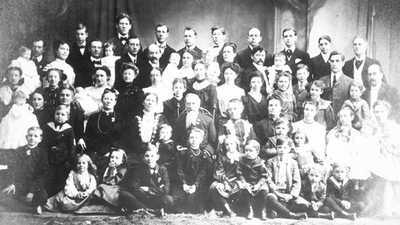 They "reorganized" the church in 1860 under the leadership of the Mormon prophet's eldest son, Joseph Smith III. This group eventually established its headquarters in Independence, Missouri, near the place that Joseph Smith had identified as the site where the Second Coming would commence. Long known as the Reorganized Church of Jesus Christ of Latter Day Saints, this group is still in existence and is now known as the Community of Christ. Of all the Mormon doctrines, none caused as much controversy as polygamy, called plural or celestial marriage within the church. They were a people who felt called by God, chosen to create a New Jerusalem. It was fitting, then, that in order to realize the dream, the Mormons endured a 1,300-mile journey of Biblical proportions. 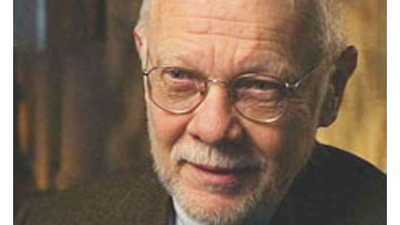 Jon Butler is Howard R. Lamar Professor Emeritus at Yale University. Butler describes the complex origins of Joseph Smith and his early church, the historical background from which both emerged, and why portions of the church's history remain problematic for its leaders and members. This is the edited transcript of an interview conducted on May 16, 2006.